See Part I for a definition of homeomorphism and torus and Part II for a bit more linear algebra. 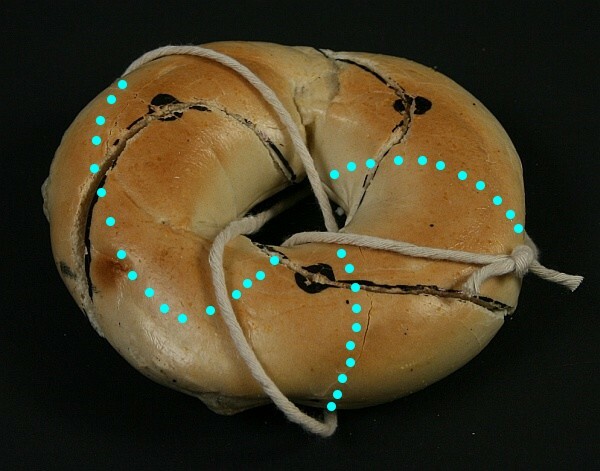 We know what homeomorphisms are (continuous functions with continuous inverses), with the famous example in the picture below: a coffee cup turns into a donut and vice-versa. A big part of geometric group theory is using shapes to come up with algebraic theorems, and using algebra to come up with shapes. One thing you can do (which we’re doing RIGHT NOW!) is take a shape, do some algebra, and then make a new shape. To be specific, our first shape is the torus. Our algebra was figuring out the group of homeomorphisms of the torus, also written as Homeo(T)- T for torus. Sometimes you’ll see , to specify that we’re talking about the 2-torus rather than a higher dimension (more on higher dimensional tori later. 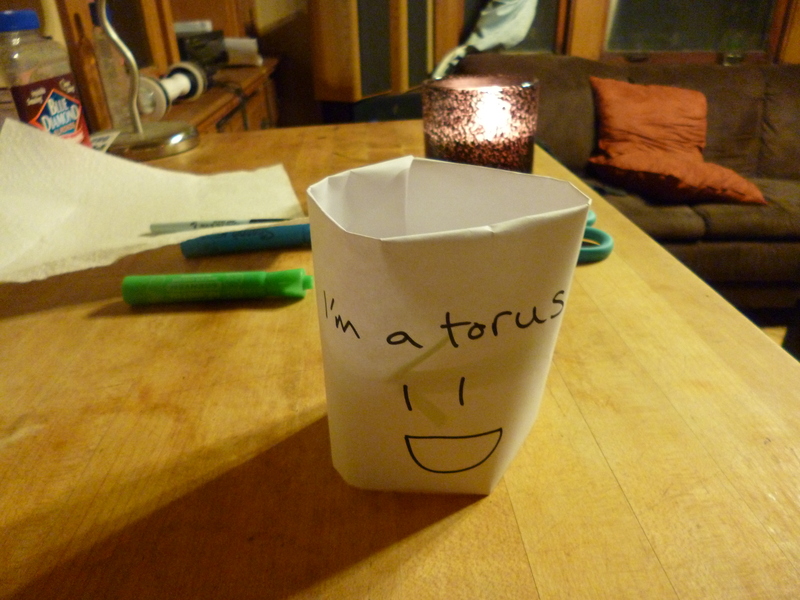 Isn’t it cool that the plural of torus is tori? Pronounced tor-eye.) Now we’re going to make a new shape from this group of homeomorphisms. Abstractly, I realize that there are many 10-year olds out there who could make a better picture than this. But I’m still so proud of myself. Exceptions to the theorem that the space of homeomorphisms isotopic to the identity is contractible. Let’s look at our current favorite from this list, $Homeo_0(T^2)$. If we start from the identity, which homeomorphisms can we isotope to? 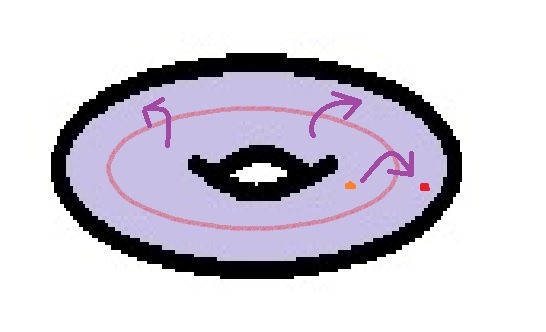 Well, I can rotate my torus around its hole-axis, and that ending homeomorphism is definitely isotopic to the identity (the rotation through time is the isotopy; where the points end up is the ending homeomorphism). Orange dot moves to red dot. Since I can rotate by all the degrees up to 360, which brings me back to the identity, this means that contains a circle- each point on the circle represents rotating the torus by that many degrees. What else can I do that’ll be isotopic to the identity? I can rotate the torus around its center circle (running through the middle of the donut), like if I was wringing out a towel. Again, orange dot to red dot. Again, I can do this for 360 degrees before coming back to the identity. 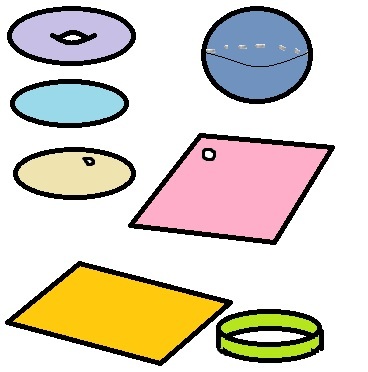 So there’s another circle, different from the first one, in . I can also do any combination of these two: I can rotate 27 degrees around the hole-axis, and then 78 around the center circle. This is true for any numbers between 0 and 360, but then 0 and 360 are the same for both. So far, we have the picture on the left. I colored it to indicate that 0=360 on both axes. Look familiar? 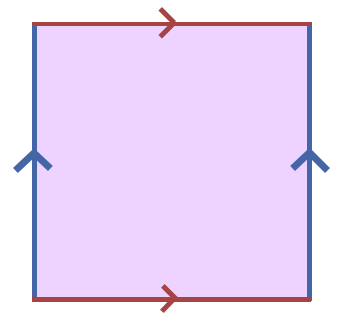 Notice that all four corners are the same homeomorphism: the identity can be had by rotating by 360 degrees in either direction, or in both directions, or by doing nothing. 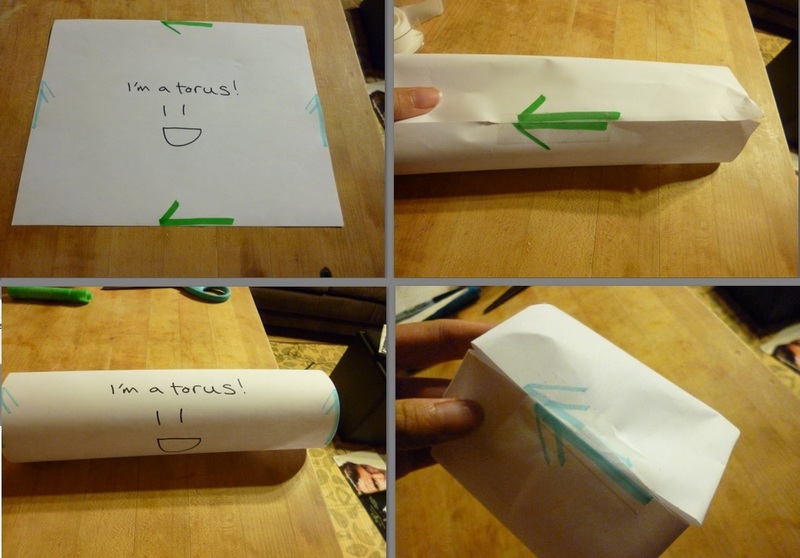 So we’ve shown that actually contains a torus! This is cool because all those other were contractible. In fact, is a torus- we’ve actually described all the homeomorphisms of the torus which are isotopic to the identity- combinations of rotations around the center axis and around the center circle. Personally I find this much more exciting than classifying the homeomorphisms by trace (yeup that’s happening in Part III, nope Part IV is coming out before Part III and you’re going to like it), probably because it involves shapes rather than numbers. Update on health: I’m taking antibiotics to help with whooping cough. So that explains why I’ve been sick for a month. My boyfriend walked by and asked what I was doing an hour ago, and I told him I was very busy feeling sorry for myself. Then I wrote this blog post to be less lump-ish. We also had a picture showing curves on the torus, represented on the grid. Remember we said that every curve on the torus could be represented by drawing it on the torus and cutting (like in the left) and then unfolding it into a line (as in the right). The left picture is what happened when I cut up the torus, while the right picture is six copies of the left pictures, as they appear in the plane. 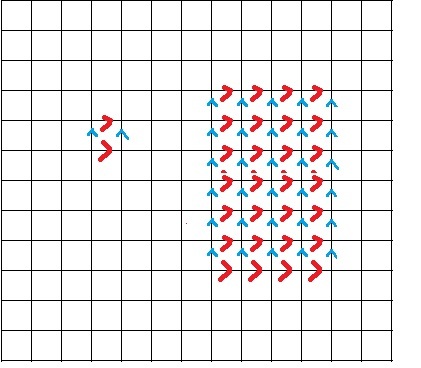 When I glue all six squares together, I can see the slope of the line, as in the bottom most green line. Notice that we can characterize this curve by the slope of the line- here’s it’s 2/3. 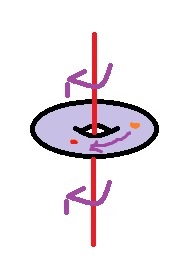 This is the same as 4/6 or 6/9, and you can see this on an actual torus by pulling the strings so that you get back to 2 times one directions and 3 times the other. Or just believe me if you aren’t into making models (I build things out of paper and tape and floss very often) [Clean floss]. So we can think of curves on the torus as rational points in the plane. Great! Here’s a fact: we can define a homeomorphism of the torus by describing where the (1,0) and (0,1) base curves are sent (in our case the red and blue curves). Why is this fact true? Because if I know where the red and blue curves go, I can figure out where any other point of the torus goes by using their coordinates (like if a point is at (1/3, 1/9) in the plane, I can send that point to 1/3(f(red)) + 1/3(f(blue)) and this’ll be continuous). Curves have to be sent to curves, so I need to assign a rational point to each base curve- remember, we associate a rational number to each curve of the torus. I can do this using a matrix . In this manner we can describe a homeomorphism of the torus by a matrix that describes where each base curve is sent via its columns, and hence we can figure out where any point is sent by writing its coordinates in terms of the base curves. Example: the identity homeomorphism sends the red curve back to itself, and the blue curve back to itself. So we want to say that (1,0) maps to (1,0), and (0,1) maps to (0,1). This means we have , which is, coincidentally, the identity matrix. You can check that this does what we want it to by multiplying the matrices . Sweet! Remember that our original idea was that somehow we could classify all homeomorphisms of the torus. So far we’ve made an equivalence between homeomorphisms of the torus and these 2 by 2 matrices. Next I’m going to lay down some facts from linear algebra, which are given without proof because honestly I forgot how to prove this stuff/all my linear algebra. Trace is invariant under conjugation. Conjugation is multiplying a matrix by another as well as its inverse: so when we conjugate A by B, we get . Trace is the sum of the diagonal elements of your matrix, so the trace of the identity matrix is 2. So this fact says that . The determinant is the product of the eigenvalues. Determinant for a matrix is given by the formula $det A = ad-bc$. The eigenvalues of a matrix are the numbers that solve the equation . We are just laying down the facts, yo. Eigenvalues scale eigenvectors. This means for any that we found earlier, there’s a vector so that . This is sort of the definition of eigenvalue and eigenvector. Woof. Lots of words, lots of terms and definitions. The next post in this series will tie together the picture of the torus and all this linear algebra and actually classify all the homeomorphisms (I’ll give you a hint; it’s by trace) as well as give some properties of them.